Huge gap exists between the "perceived"​ and "actual"​ IT security level of the organizations. Such gaps are revealed after security incidents or by costly and manual security audits for the lucky ones. With its unique approach, Picus Security continuously assesses security controls and reveals deficient ones before hackers do. Picus provides risk-free assessment of your security defenses by simulating real-world attacks. Picus virtual peers mimic both the attacker and the victim systems to fool security defenses in your production network. 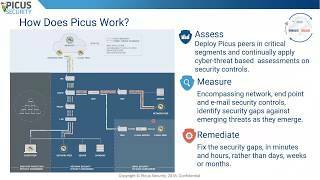 Picus Remediations are like having an actionable to-do list which enables you to increase your security level. Proposed actions are customized for your existing infrastructure. The easy-to-apply signatures are ready for your use. Picus also shipped with open source remediation know-how which can be consumed by your security technologies. Enterprises need to track new threats and react them in a timely manner but fast response to emerging threats is impossible without measuring Security Operations. Picus developed Agile SecOps methodology to help enterprises to systematically and timely beat the threats, not get lost fire fighting and be resilient continuously. Assess: Picus’ patent-pending assessment methodology simulates real-world threats in production networks with no interruption to assets. Measure: Interactive dashboards presents the overall picture with objective metrics and list the gaps revealed. Remediate: For gaps revealed during assessments, Picus provides vendor specific remediation signatures and creates a prioritization list.